Marvel Studios has managed to do what many others have failed to do: continue to refine their niche and get better at it. There certainly have been some Marvel stinkers in the past. And as off track as Iron Man 3 was from a storytelling standpoint, it still was a pretty fun flick. And what Marvel has been accomplishing, is bringing an entire, cohesive universe to their audience. And managing to do it better with each release. Consider the Harry Potter series. We know these characters. We know the rules. We know the world. And because of that, we grew to love that world. The Marvel Universe is no different, but it is even more expansive. There are so many characters that can have their own films, but the stories intertwine inbetween those films. Its marketing genius…which isn’t surprising considering that Disney is the parent company. 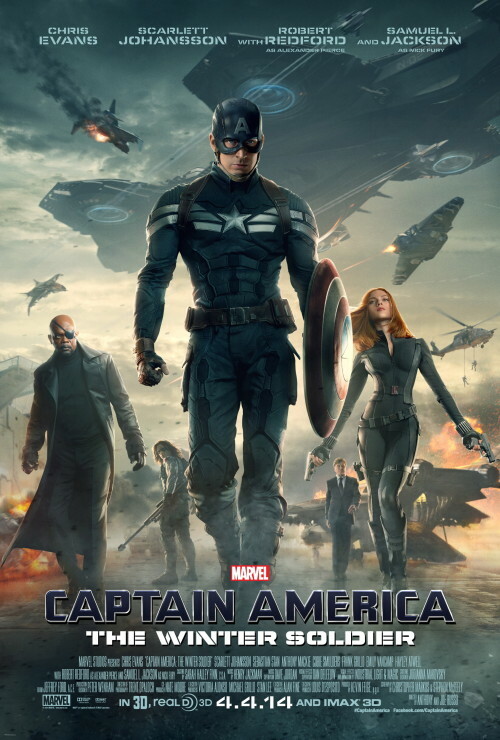 The film starts off with Steve Rodgers (Chris Evans) outrunning another runner as they circle paths around D.C. Within the first 5 minutes, we know where Rodgers is as a character, we’ve met a new character, Sam Wilson (Anthony Mackie), who we immediately like, and the plot points are planted. Jump directly into a mission situation where we get to see our superheroes in action: both Captain America, the luscious Black Widow (Scarlett Johansson), and their support team. I have to say that my VFX brethren have started to balance out the superheroism and physics. Yeah, we get that they are doing things that are beyond plausibility — but the action is starting to become more grounded. Enough that it doesn’t completely pull me out of the film. The action is adrenalizing and the fight scenes have a beautiful, almost ballet kind of grace — but mixed with violent energy. The plot is tight, and it doesn’t feel like there is a lot of fat, even in the light of it being two and half hours long. It doesn’t feel like it. The nuggets of information are dropped in the right way, and with the right amount of subtlety that you can stop trying to predict what the plot is and ride out the revelations along with the characters. Plus there are a number of pertinent themes going on, the most obvious is how far does a system go to protect the freedom of the people until the process itself sacrifices that freedom. But deeper than that is trust: Trust in your government. Trust in your friends. Trust between soldiers. And finally, a sense of brotherhood — in a mankind sense — but reflected between Captain American and The Winter Solider, between Nick Fury and council leader Alexander Pierce, and new team member Sam Wilson, and the loss of his wingman during a tour of duty — and his newfound wingman in Steven Rodgers. Directing brothers, Anthony and Joe Russo, managed to get themselves into this position by some way of a miracle. With their only notable feature directing gig to be You, Me, and Dupree, they didn’t seem to have the pedigree to take on such a huge film. But to their credit, they did. And they pulled out something better than veteran Joe Johnston did. Fortunately, they had a screenplay from frequent writing collaborators, Stephen McFeely and Christopher Markus, who wrote the original Captain America: The First Avenger, and Thor: The Dark World (undeniably the superior of the Thor films), so they understand the Marvel universe. Additionally, to the Russos’ credit, they were able to take their comedy chops from Arrested Development and sprinkle it throughout the storyline. Its a humor that is grounded and real, and never falls back on 80s action hero catch phrases. Not surprisingly, the visual effects are top shelf, led by industry staple Industrial Light & Magic, as well as destruction and water specialists ScanlineVFX, a substantial team from Luma Pictures, and supporting work from Whiskytree and RISE. Lola also reprises its “Weakling Steve Rodgers” effects for a couple key moments in the film, and probably made Robert Redford look 78 years old rather than 427. And not to leave out the special effects work, Legacy Effects contributed immensely, including The Winter Soldier’s garb and metal arm, and I presume Falcon’s backpack and armor. Totally fun film on all counts. Completely cohesive with the rest of the Marvel Universe. And we don’t have weepy superheroes whose adoptive Dad told to hide his super powers. If I had any critique, is to grounded in the design of Captain America from the get go. He is a do-gooder to the extreme, so he frequently comes across as one note. But what I like about that aspect of him is that despite being a “super” man, he is still mortal — and so his convictions still come with a risk. And that is put to the test in this film.